I’m now offering a five issue subscription for Personal Best. 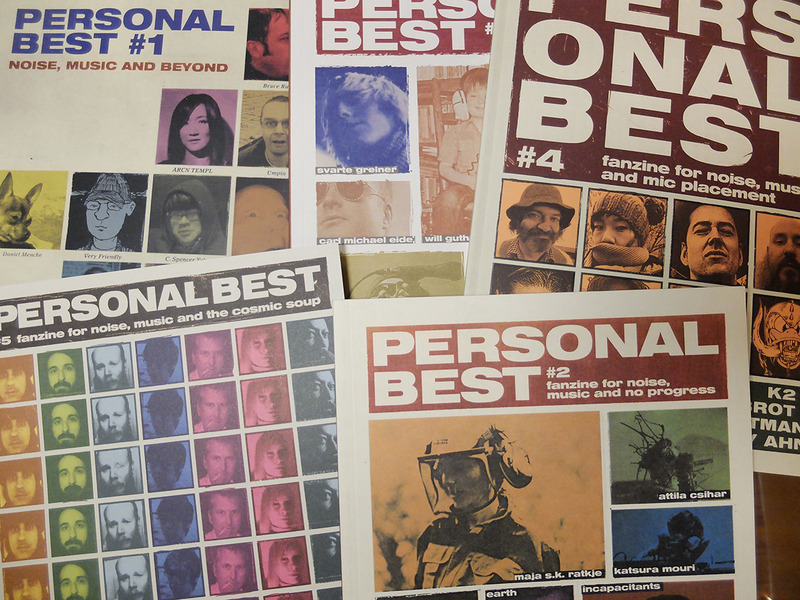 For €65 (Europe) or €85 (rest of the world) you’ll get the five next issues of Personal Best sent to you when they’re published. This is a one-off deal for issues #6 to #10. The offer stands till November 30th. Producing Personal Best is a rewarding venture, and I’m glad for all the positive feedback I’ve gotten from many of those who’ve picked it up. It seems like it filled some kind of gap – that a 100 page in-depth interview-only fanzine for esoteric music was needed in our social media information overload era. People have asked for a subscription deal before, but I’ve been hesitant to commit to an arrangement like that, simply because I didn’t know how many issues I’d make – the life expectancy of underground fanzines being closer to a moth than a turtle. But as I’ve now got enough material to fill the next three issues already, I figure now’s the time to do it. Be sure to state your address clearly. Personal Best #6 will ship early 2016. It will feature Marcia Bassett, PBK, Joe McPhee, crys cole, Skaset, Lucas Abela and more. Personal Best 1 to 5 featured these creatures: Bruce Russell, Arcn Templ, Umpico, Daniel Mensche, Ronnie Sundin, C.Spencer Yeh, Tommi Keränen, Sete Star Setp, Chulky Hong, Sissy Spacek, Sindre Bjerga, Zweizz, Oren Ambarchi, Maja Ratkje, Don Dietrich, Earth, Incapacitants, Damage Digital, Phil Blankenship, Vanhala, FNS, Attila Csihar, Katsura Mouri, MoE, Carl Michael Eida, Phill Niblock, Svarte Greiner, Pumice, Graham Lambkin, Will Guthrie, Torturing Nurse, The Menstruation Sisters, Jim O’Rourke, Arabrot, Keith Fullerton Whitman, Kobi, Marco Fusinato, Ray Ahn, Okkyung Lee, K2, Anla Courtis, Rudolf Eb.er, Makino Takashi, Dennis Tyfus, Jenny Hval, GFrenzy, Fecalove.